On June 4, 2018, President of Civil Society Development Center (CSDC) Nino Todua, Attaché of the Federal Republic of Germany, Thomas Soll, and Tinatin Khantadze, the representative of Economics and Development, visited the Dusheti municipality. A meeting was held with the Mayor of Dusheti municipality, Mr. Zurab Sekhniashvili. 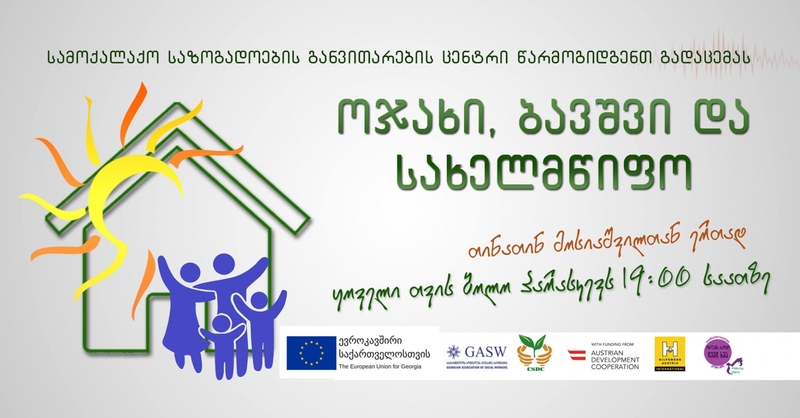 In May, Civil Society Development Center(CSDC) held an informational campaign with parents of Tbilisi and Rustavi schools within the transitional educational program. On January 12, Online Radio “My Voice” broadcast the first program of “Family, Child, and Government” in 2018. On May 18, 2018, the Regional Manager of the Austrian Development Fund, Nicole Maria Bauer, visited the Dusheti municipality. On May 31, the Ministry of Education and Science of Georgia hosted an annual volunteer exhibition / forum organized by the NGO Helping Hand. In April and May, within the framework of the transitional educational program, Civil Society Development Center(CSDC) conducted educational and cultural events for homeless children.